North America from Alaska and Canada to Florida and California. Wooded areas near seacoasts, marshes, reservoirs, lakes and rivers where fish are abundant. Open water, such as a lake or ocean, is a necessity. Bald eagles have excellent eyesight, large talons and a hooked beak. 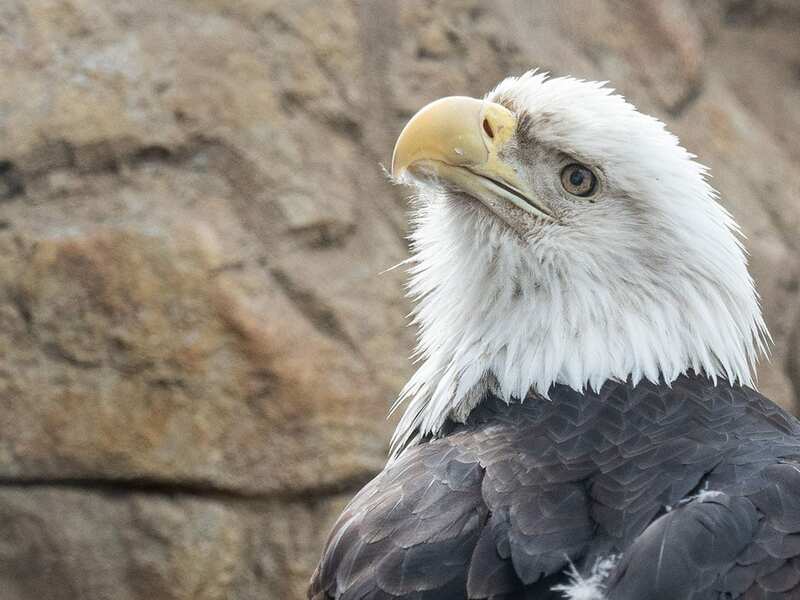 These adaptations aid eagles in finding, catching and eating their prey. An eagle’s excellent eyesight is used while hunting when soaring high above the ground or from perches overlooking the water. Once prey is located, they dive at a gradual incline and catch prey with their powerful talons inflicting a vice-like killing grip. They fly off carrying their prey, which can often weigh half as much as the eagle. The large hooked beak is used for tearing into the prey. Eagle nests, called “eyries”, are built as high as possible, usually 60-100 feet off the ground, to maintain better visibility. New nests average five feet across and two feet deep. Mated pairs use the same nest year after year, remodeling them by adding feathers, moss, sticks and branches. After repeated use, nests may reach more than 10 feet wide and weigh several tons! Preferring solitude, bald eagles do not like to nest near humans. Bald eagles can fly 20-40 miles per hour (32-64 km) in normal flight and can dive at speeds of 75-100 mph (120-160 km). They can fly at altitudes of 10,000 feet or more and can soar in the air for hours riding on natural wind currents and thermal updrafts. Their large wingspan enables them to soar without flapping their wings very often and helps conserve energy as they hunt for prey. Bald eagles are 29-42 inches (73-107 cm) long from head to tail. They have a wingspan of six to eight feet (1.8-2.4 m). Males weigh seven to 10 pounds (3.2-4.5 kg); females are larger, weighing up to 14 pounds (6.4 kg). Adults have dark brown feathers on the body with white feathers on the head and tail; juveniles are mostly mottled brown without a white head. In the wild: Primarily fish but also small animals and occasional carrion, due to their opportunistic nature. At the zoo: A bird of prey diet, rats, mice and fish. As a predator at the top of the food chain the adult bald eagle does not have any natural predators. Bald eagles are either solitary, live in mated pairs or live in family groups consisting of a mated pair with their current offspring. There are also communal gatherings of bald eagles at feeding sites where food is abundant. Once bald eagles are mature at about six years of age, they participate in dramatic aerial courtship displays to attract a mate. Bald eagles are monogamous, mating for life. They build a nest two feet deep and five feet across high up in a tree. The female lays one to three dull white eggs and incubates the eggs for 34-37 days while the male brings food to her. Newly hatched eaglets are covered with light gray downy feathers. Both parents share the duties of feeding, brooding and protecting the eaglets. The eaglet’s feathers turn dark brown by the time they reach full size and fledge at about 12 weeks of age. They develop mottled brown and white feathers on the head and tail during their third and fourth years, but do not develop distinctive white feathers on the head and tail until they are four or five years old. Bald eagles live 15-30 years in the wild and up to 48 years in captivity. Bald eagles are often seen stealing prey from other birds! The bald eagle was declared the official national emblem of the United States in 1782, much to Benjamin Franklin’s dislike. He thought the bird demonstrated bad moral character (stealing food), and would have preferred the turkey as the national emblem. The bald eagle’s scientific name (Haliaeetus leucocephalus) means “white-headed sea-eagle”. Bald eagles can swim! They use an overhand movement of the wings similar to the butterfly stroke. Pesticide use and hunting led to a steep decline in the bald eagle population in the mid 1900s. By the 1960’s there were only about 400 breeding pairs of bald eagles in the lower 48 states. The pesticide DDT, that caused thinning of eggshells, was banned in 1972 and the bald eagle was placed under the protection of the Endangered Species list in 1973. Through conservation efforts, the decline of the bald eagle has been reversed and the population has rebounded. The status of the bald eagle was changed from endangered to threatened in 1995 and bald eagles were officially removed from the Endangered Species Act on June 28, 2007. The current population of bald eagles is estimated at nearly 10,000 breeding pairs in the lower 48 states. Although the bald eagle is still protected by federal laws, they face threats from habitat loss, illegal trapping and shooting, and collisions with utility poles and vehicles.